Jake Gyllenhaal's most unusual role in years is a normal guy. In Stronger, Jake Gyllenhaal as Jeff Bauman, a real person who lost his legs in the Boston Marathon bombing. In 2010, Jake Gyllenhaal faced something of an impasse. His bid for mainstream blockbuster movie stardom, Prince of Persia: The Sands of Time, had done about as well as every other ill-conceived video-game adaptation that preceded it, and his career—a mix of oddball performances like Donnie Darko, hyperintense efforts like Jarhead, more prestigious roles like Zodiac and Brokeback Mountain, and blockbuster fare like The Day After Tomorrow—presented a contradicting impression of an actor: one who had the look and fame of a mainstream movie star, but always seemed to be more comfortable, and more successful, in stranger, less commercial films. Decades from now, we’ll see Gyllenhaal’s response to that dilemma—along with that of his comrade in handsome weirdness, Robert Pattinson—as a master class in how to remake your career. Despite having played the lead in multiple nine-figure studio tentpoles, Gyllenhaal put aside his ego and spent the next half-decade placing himself in the hands of strong-minded directors, including Denis Villeneuve (twice), Duncan Jones, David Ayer, Dan Gilroy, Tom Ford, and Bong Joon-ho. The result was a string of films that completely remade his image, transforming Gyllenhaal from a smooth-faced actor of indeterminate style into an explosive performer capable of creepy derangement (Nightcrawler), darkness (Prisoners, Enemy, Nocturnal Animals), and, uh, whatever it is that he’s doing in Okja. During this stint, he was still making studio movies, including Everest and Life, as well as more recognizably Actory dramas like Southpaw, but his identity had become that of an indie striver whose presence generally indicated a challenging film with something on its mind. However, this kind of license to be weird can become a double-edged sword for an actor: Often, it’s hard to return from the orbit of outsize, hyperbolic performances toward more human and emotional roles, which can feel quiet and unexciting in comparison. If you’re not screaming into a mirror and then breaking it, then you’re not really acting, you know? Gyllenhaal’s first attempt to return to the quotidian, Demolition, bore the black mark of quirk that mars many indie considerations of quote-unquote real people, and it was a rare misfire from the otherwise red-hot Jean-Marc Vallée, who maybe should’ve just cast Gyllenhaal in Big Little Lies—the Alexander Skarsgård role would’ve been right in the Nightcrawler wheelhouse. But just as his work with Villeneuvev in Prisoners and Enemy indicated a transition post–Prince of Persia, David Gordon Green’s Stronger marks a new phase in Gyllenhaal’s career. In Stronger, Gyllenhaal takes on the character of Jeff Bauman, a real person who lost his legs in the Boston Marathon bombing and became a symbol of the city’s endurance in its wake. When considered in the light of his recent work, Stronger puts Gyllenhaal in an unusual position: He plays the most regular of guys, a working-class, beer-drinking, suspended adolescent who still lives with his mom. 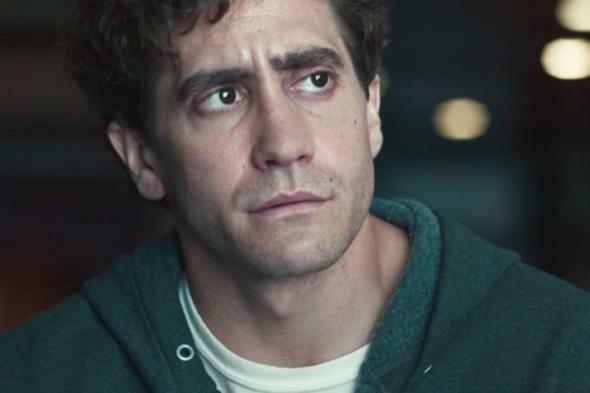 Stronger only spends a brief period with this version of Jeff, and Gyllenhaal lends him a clumsy enthusiasm, his face wide-open and eager to please; you can see why Tatiana Maslany’s Erin keeps falling for his flimsy appeals even though, on the surface, he seems to be going nowhere. When the bombing takes both of Bauman’s legs, though, the movie—and Gyllenhaal’s performance—changes gears. Stronger is notable, and remarkable, for how determinedly it portrays the horror and trauma of Bauman’s life: While the world around him imagines a hero and survivor, Bauman just sees a fraud, a man reduced both physically and emotionally. He drinks; he slides into depression; he neglects and takes advantage of Erin’s devotion. Green does such an effective and thorough job of rendering Bauman’s disintegration that, three-quarters of the way into the two-hour film, you start to wonder how the hell he’s going to deliver the obligatory happy ending; that he manages to do so (mostly) successfully is a testament not only to his deft touch, but also Gyllenhaal’s achievement. One of the most marked differences between Gyllenhaal’s recent work and his pre–Prince of Persia career is that he’s turned into a bomb thrower: His performances tend to feature a handful of wild outbursts that allow him to showcase his physicality. In Stronger, he puts that tendency aside, and it’s the great revelation of the film, calling to mind a sweetness and vulnerability that he hasn’t tapped into since the early part of his career. Despite the enormity of Bauman’s transformation in the film, Gyllenhaal’s performance in Stronger is a quiet one, to the point that he’ll often go entire scenes barely saying a single word, his mother and girlfriend doing his talking for him—a poignant portrayal of how women are often required to do the emotional work for men. During these scenes, Gyllenhaal seems to shrink, his body language a picture of deflection and avoidance: He hunches his shoulders, turning his head away, holding his beer in front of his face. While Gyllenhaal still gets a quality outburst further into the movie, Bauman isn’t a sociopath or a rage monster, and he certainly isn’t Dr. Johnny. He’s a normal person totally overwhelmed by the magnitude of his experience, and Gyllenhaal occupies that experience from a place of genuine fear and uncertainty. It’s also what makes that ending possible: Even in Bauman’s grimmest moments, Gyllenhaal seeds a desire to connect with those around him that can eventually be channeled into his salvation. Playing the central figure in a true-life story of perseverance might seem like the safest decision for an actor—and in many cases, it is. But under Green’s direction, Gyllenhaal’s acting in Stronger is the most challenging and revealing work he’s done in years, and exactly the right role for this point in his career. There are few actors in their 30s more well-rounded than Gyllenhaal right now, as capable of taking on disturbing psychologies in aggressive indies as they are the lead roles in crowd-pleasing tearjerkers. And to think: He could be making Prince of Persia 3 right now.